Brownies are a weakness of mine for sure. 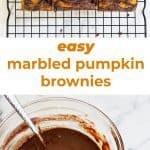 And a good marbled brownie recipe, especially one that involves pumpkin, is a good thing to have in your recipe rolodex. I don’t actually have a recipe rolodex, but man, now that I’m thinking in that direction, it sounds totally charming but probably a bit impractical. Of course just scrolling through saved recipes on your phone or iPad makes a lot more sense…but flipping through an alphabetical rolodex looking for your favorite brownie recipe just sounds adorable to me. I digress. Not all brownies are created equal, of course. Some of are more cake-y while others can have a consistency almost resembling fudge. These are somewhere in the middle. I don’t like to feel as if I’m eating raw batter, but I do like my brownies slightly undercooked in the center. Oxymoronic? Maybe. But I really like brownies that are just as good the day after you bake them, and to me walking the line between not baked enough and over-baked is how you get that. You could even under bake these by a couple more minutes than I suggest and once cooled, cut and freeze them. Options. I’m all about it. Melt the butter and chocolate in a double boiler or in the microwave in 30 second increments until just melted. In another bowl, stir together the sugar, eggs and vanilla extract (only the amounts listed under brownie batter above). Once the chocolate/butter has cooled some, stir the chocolate mixture in with the egg/sugar mixture. You don’t want the chocolate mixture to be too hot here because eggs have a tendency to very quickly respond to heat. So if the chocolate mixture is piping hot, it could cook your eggs and create a funky texture in your brownie batter, which you don’t want. Then stir in the flour, baking powder and salt. In a small bowl, stir together the pumpkin batter ingredients listed above. Pour 3/4 of the brownie batter into a square baking pan that has been lined with parchment paper. Spoon the pumpkin batter over the top of this. Then add the remaining brownie batter and swirl with a butter knife. Bake at 350°F for 28-30 minutes. A toothpick inserted anywhere other than the center should come out clean, while the batter may still be just a little undercooked in the center. Again, this is just my preference. These look yummy! I bought a huge pumpkin earlier this week and so far I’ve made pumpkin soup, two different kinds of pumpkin muffins and now this recipe is next on my list – thanks for the inspiration! These look amazing!! I’m loving all things pumpkin, but why haven’t I thought of the pumpkin/chocolate combo before? And, you really can’t go wrong with brownies. Making these for sure! Always looking for new & exciting pumpkin recipes. This one will do the trick. Thank you! Do you think it would work out if you made the pumpkin mixture and just combined it with regular brownie mix in the case that you happen to have entirely too many boxes of brownie mix at home? Not only do these look amazeballs, but I just love reading your recipes Emma! The little comments and stories are my fave! I’m going to try this with GF ingredients and get back to you. Nom Nom Nom. Three loves in one dessert, chocolate, pumpkin, and brownies. What could be better? Thank you , can’t wait to try it :). All we can say is: YUM! I’m seriously intrigued by these! These look so delicious! Brownies are also one of my weakness. I never tried the pumpkin topping but I would love to because I LOVE pumpkin! These are totally perfect for Halloween. Love the orange marbling! They look so delicious! Heavenly, and I love how the pumpkin topping is marbled! I made this. It is very easy and tasty. This recipe is amazing. I made these last night. I doubled the recipe and didn’t have quite enough eggs (used 4 for the brownie batter and only 1 for the pumpkin topping) but they turned out really well. I love the marble counter top beneath the marble brownies – nice touch! I’m very eager to try out this recipe. This recipe sounds really delicious. We usually don’t use pumpkin in sweet products that much in Scandinavia (and it’s impossible to buy pumpkin purée in a can – you need to bake the real pumpkin to get the purée), but this fall I’ve seen to many great recipes online that I’ve started trying out different things myself. I imagine the combination pumpkin and chocolate are great! Made these, they are good but would have loved to taste more pumpkin. I think adding pumpkin spice may help… also had to bake 10 minutes longer for a tooth pick to come out clean. But overall good tasting brownies.